Did You Know … we offer award-winning web hosting? Did You Know … we offer award-winning web hosting? That’s right! 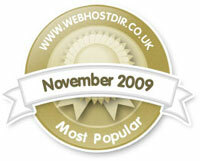 We’ve been winning awards since 2003 and we love it when our great web hosting service is recognised for what it is. simplewebhosting.co.uk has won awards for shared web hosting, propecia for hair loss target=”_blank”>budget web hosting, Windows web hosting, reseller web hosting, e-commerce web hosting and web design. Take a look at our online trophy cabinet where you can view all our awards.